Many years ago it was popular to play giant checkers. 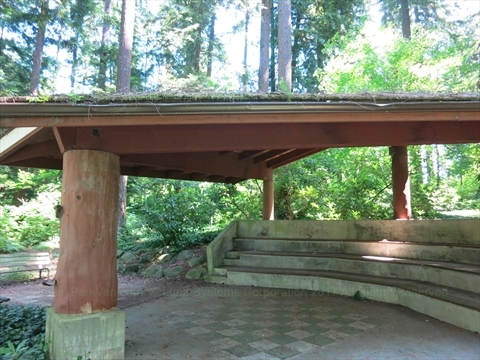 Supposedly, there were 3 spots in Stanley Park where you could play. Now, we can only find one location that has 2 checkerboards. One of the checkerboards has an elaborate roof and a small 3 row grandstand for people to watch the game. We have never actually seen anyone play giant checkers in Stanley Park, but you could if you wish and you had the pieces. You could also play giant chess if you wanted. If anybody knows the location where the other 2 checkerboards used to be in Stanley Park, please contact us to let us know! The giant checkerboards is just off of Pipeline Road on the right just a little past the Rose Garden.